On January 23rd, 2019, I got my first Opinion letter published in our local newspaper, The Providence Journal. 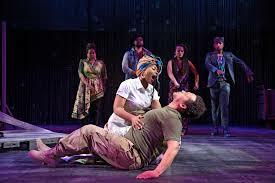 I was so mad about a review of Trinity Repertory Company’s play, black odyssey, written by the paper’s theater critic, Channing Grey, that I just had to write the letter. It is an epic tale–a layered journey of storytelling, with song, ritual, and time travel through ancient and current history of the African diaspora, including black American history and culture. The play is two hours and fifty minutes in length. Performances are strong but Marcus Gardley’s play needs more depth and fewer plot twists. As “black odyssey,” the latest from Trinity Repertory Company, grinds to its long overdue conclusion, playwright Marcus Gardley does his best to tie up three hours of loose ends. But this scattershot retelling of Homer through the lens of black America is beyond saving. It seems Gardley has thrown two centuries of black history against the wall to see what sticks. Unfortunately, just about everything does, making for a dizzying night of theater. More than a little trimming would be welcome. In this modern-day adaptation of the famed Greek epic, Ulysses Lincoln, played with customary passion by Joe Wilson Jr., takes the scenic route back to Oakland after a tour in Afghanistan that has left our hero scarred and none too eager to return to a country he may have fought for but where he doesn’t count. Not a bad premise, one with the makings of a powerful night of theater had Gardley not felt the need to stuff his script with fleeting references to historical events including the lynching of black teenager Emmett Till in Mississippi in 1955 and the 1968 assassination of the Rev. Martin Luther King Jr.
That’s not to make light of any of these shameful chapters in our history. But in “black odyssey” they come at us so fast, with such glancing blows, that they might as well be items on a grocery list. There are also times when Gardley tries too hard to connect the dots, to cover all the bases. It’s not enough to show Ulysses as a tortured slave; Gardley has to throw in a parallel scene in which Ulysses’ son, Kai Tshikosi’s Malachi, is subjected to police brutality. Again, more depth would have been nice, and fewer twists of plot that became just too much of a chore to untangle. A case in point: Ulysses turns up on a raft, as flood waters inundate New Orleans. There’s talk of Hurricane Katrina, but maybe it’s the biblical flood, in this case created by God weeping over the death of Martin Luther King. It’s 1968, Ulysses is told. But he has not been born yet. And isn’t he still floating off the coast of Africa? At the same time, the whole saga is cast as a chess game played by Zeus and Poseidon, here Great Grand Daddy Deus and Paw Sidin, who behave like petulant 5-year-olds. And that unneeded conceit just makes the whole evening more fragmented, where the few dramatic moments don’t have much in the way of context. At one point, an armed Ulysses comes face to face with a young Afghani, only to have the whole scene dissolve into the two competing gods calling out a chess move. The New Yorker has dubbed Gardley the heir to Tennessee Williams. But based on this script, that’s overly generous. For his writing is a blend of street slang and flowery imagery that’s often way too heavy-handed. The show does contain some impressive acting from Jude Sandy, who like most cast members juggles several roles, from a regal Deus to an outrageous Super Fly, who scoops Ulysses from the Atlantic and deposits him on the West Coast. Don’t ask. Omar Robinson, who’s done lot of work in Boston, had no trouble morphing from a fast-talking Paw Sidin, out to avenge the death of his son at the hands of Ulysses, to the unctuous suitor of Ulysses’ wife, Nella. She is played by Kalyne Coleman, a student in the Brown University/Trinity Rep master’s of fine arts program, who did a nice job making the transition from tough project dweller to a woman of poise and self-confidence. But no one was more impressive than Broadway veteran Julia Lema, the goddess who becomes mortal to aid Ulysses, and who plays out her life on earth with such grace, and a dash of sass. The singing, which plays a big part, was not too shabby either. The few moving moments almost always involve song, whether African tunes, spirituals or soul, the latter from the likes of Diana Ross, Tina Turner and James Brown, who appear in one of the more outrageous scenes as the three beguiling sirens. The show, co-directed by Wilson and Sandy, takes place in the smaller downstairs theater, outfitted with two banks of TVs that flash images of the ocean and serve as seats for the gods. That’s the work of Edward E. Haynes Jr.
Trinity, of course, should be applauded for offering shows that appeal to often forgotten audiences. One would hope, though, that there are more eloquent scripts out there that capture the black experience with more depth and heart, and don’t worry so much about the kitchen sink. It pained me to see Channing Gray’s dismissive tone throughout his Jan. 9 review (“Trinity Rep’s ‘black odyssey’ could use some trimming”). When he says the play could “use some trimming,” tries to cram too much in, and needs more depth, it contradicts the point of the play’s retelling of the staggering, epic story of Homer’s “The Odyssey.” Gray, in his call for more depth, himself glosses over the play’s use of song and ritual from the African diaspora, in a way that shows the lack of depth of his own understanding of African and black American culture. This review shows me, as a white woman, the harm a cultural critic who does not represent the race or culture of the story being told, can do to the artists, arts institutions, community, and especially, the black and brown people sharing their artistry, and their story, with a public audience. We, as white people, cannot fully know this story. How, then, can we critique it? While white people may have opinions on a work by a black artist, we must realize we are looking through our white-centered lens. We must take responsibility for what we say, knowing that we lack the true understanding or experience of living in the skin of a person who is different from us. Perhaps if we admit this, we can make the better choice of soaking in an experience, and having gratitude for the work of black artists, without seeing ourselves as experts with the ability to comment on it. Wendy Grossman’s Jan. 24 letter (“White critic cannot fully understand ‘black’ play”) illustrates beautifully what is wrong with America today. Art is a human experience and it is false and stupid to try to divide art into categories that can only be appreciated by certain races. Of course, different cultures make distinctive art: Ukrainians have their pysanka eggs, Africans have their wooden masks, Greeks have their statues, the U.S. has Andy Warhol. If a white man cannot understand a black play, does that mean blacks cannot understand or appreciate Michelangelo’s David? Does one have to be Jewish to appreciate Holocaust art’s depiction of suffering? There is no “white-centered lens” through which to view art. The problem with us today is that when such idiocy is spouted, no one speaks up to correct it. True art speaks to all humans and can be appreciated by all humans. Maybe the letter writer prefers propaganda “art” that speaks to only a certain group while demonizing others. To say people lack an understanding of art because they are of a different race than the artist shows no understanding that we are all God’s children, created in all different shapes, sizes and races and all capable of appreciating true beauty in life and art. Such an attitude shows the insidious divisiveness prevalent in our country today. More Americans need to speak up anytime they hear such drivel and correct it. In regard to my letter, and the rebuttal letter, friends of mine rallied and showed me their support, first, for the fact that I wrote my letter, and then for what they felt was the disrespect Mr. Slonka gave me. They also took to task, his many, and they would say I’m being too kind here, unenlightened points-of-view. A few even volunteered to moderate a conversation between me and my new fan. But I decided I have better places to put my energy. I mean, I did for a moment think I would write a rebuttal to his letter, and begin by delving into, and unpacking Mr. Slonka’s succinct take on art history, “… Ukrainians have their pysanka eggs, Africans have their wooden masks, Greeks have their statues, the U.S. has Andy Warhol….” but I thought it far more worth it to annotate Channing Gray’s review instead. This is how I made meaning of Gray’s letter when I read it. Knowing that we all have our own unique perspectives we bring with us when we view, or take in a piece of art, and knowing there were signifiers in the play that I, as a white-skinned, Jewish woman, would not always ‘get,’ I went ahead and inserted my own comments after each numbered paragraph. I tried to do this with bubble comments, but they did not transfer within this blog format. You will find the corresponding comment directly beneath the paragraph that is cited. I invite all of you dear readers to add your additional annotations in the comments section below. I feel like I could have had a comment for each and every sentence, but again, I left some space for all of you to add your own. As “black odyssey,” the latest from Trinity Repertory Company, grinds to its long overdue conclusion, playwright Marcus Gardley does his best to tie up three hours of loose ends. But this scattershot retelling of Homer [O1] through the lens of black America is beyond saving. [O 1]As a white, male of European descent, I only understand the Western, European, prescribed art criticism lens of storytelling I am used to experiencing. [O2]Yeah, because who really has time to sit in a theater and account for 400 years of what you later call our “shameful history.” Sit down, Mr. Gray. Black odyssey is 2 hours and 50 minutes in length. Seems this play has another 3,504,000 hours left to tell its story. [O3] Oh, Mr. Gardley, please spare me the agony, as a white person, of having to have the full continuum experience of bearing witness to black people’s pain, says Gray. At the same time, the whole saga is cast as a chess game played by Zeus and Poseidon, here Great Grand Daddy Deus and Paw Sidin, who behave like petulant 5-year-olds. And that unneeded conceit just makes the whole evening more fragmented, where the few dramatic moments don’t have much in the way of context. [O5] At one point, an armed Ulysses comes face to face with a young Afghani, only to have the whole scene dissolve into the two competing gods calling out a chess move. [O5]Mr. Grey, please see Comment 4 in reference to non-Western storytelling. Chess is a complex, layered game. Marcus Gardley’s, black odyssey, is a complexed, layered story. P.S. Gods are conceited sometimes. Omar Robinson, who’s done lot of work in Boston, had no trouble morphing from a fast-talking Paw Sidin, out to avenge the death of his son at the hands of Ulysses, to the unctuous suitor of Ulysses’ wife, Nella. She is played by Kalyne Coleman, a student in the Brown University/Trinity Rep master’s of fine arts program, who did a nice job making the transition from tough project dweller to a woman of poise and self-confidence. But no one was more impressive than Broadway veteran Julia Lema, the goddess who becomes mortal to aid Ulysses, and who plays out her life on earth with such grace, and a dash of sass. The singing, which plays a big part, was not too shabby either[O7] . The few moving moments almost always involve song, whether African tunes, spirituals or soul, the latter from the likes of Diana Ross, Tina Turner and James Brown, who appear in one of the more outrageous scenes as the three beguiling sirens. [O7]A big, big part. Note to self: send Mr. Gray a thesaurus, and a nudge to speak more (after you educate yourself on another people’s culture) on the real important components of a work of art. Better yet, read Donja R. Love’s article, and leave this review for the proper critic to critique. [O8]”Yes, queens, in my opinion, you should be applauded, and you deserve all the cookies for providing space for a play that that poor, forgotten black audience will like.” says Gray. [O9]I suspect if Mr. Gray liked Mr. Gardley’s play, he would have said the work was eloquent. Regarding the “kitchen sink,” again, sorry for giving you too much history and culture that took up three hours of your time. Thanks for following along. Remember to add your annotations below.